New techniques can be scary to tackle alone, so let's try this one together! 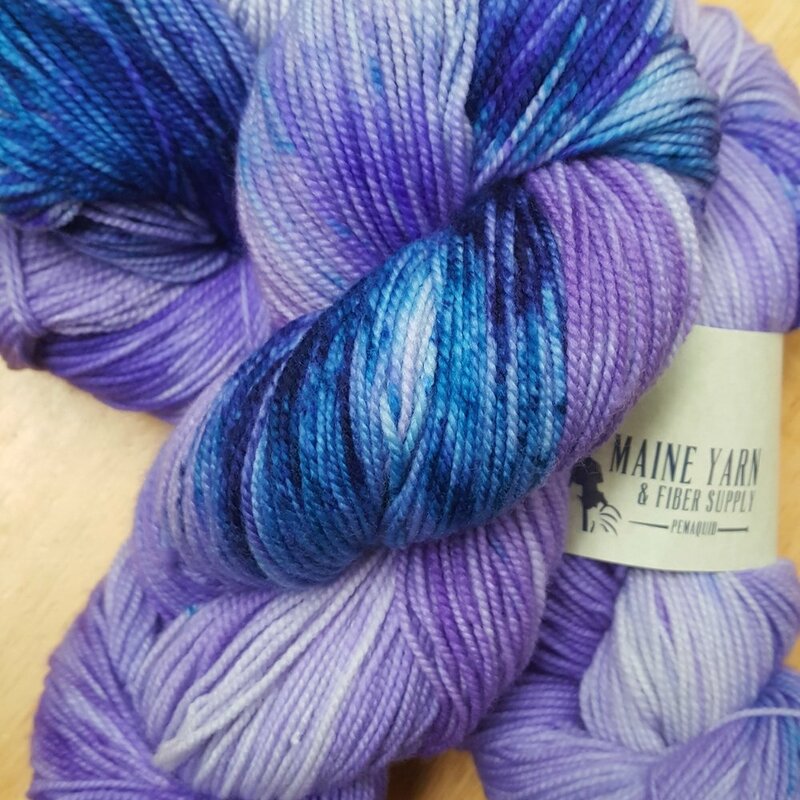 Brioche is a great way to show off your favorite hand-dyed/variegated yarns. We will be utilizing Justyna Lorkowska’s pattern; Pretty Brioche Thing and our house yarn Moxie to create a chunky-yet-funky cowl perfect for any Maine adventure. Prerequisites: Must be able to cast-on, knit, purl, and bind-off in the round on circular needles. Prep work/Materials required: Please download the free pattern from Ravelry and have a copy with you when you come to class. You will need a size 11 circular needle with a 16in cable and a stitch marker. Yarn is included in price of the class. 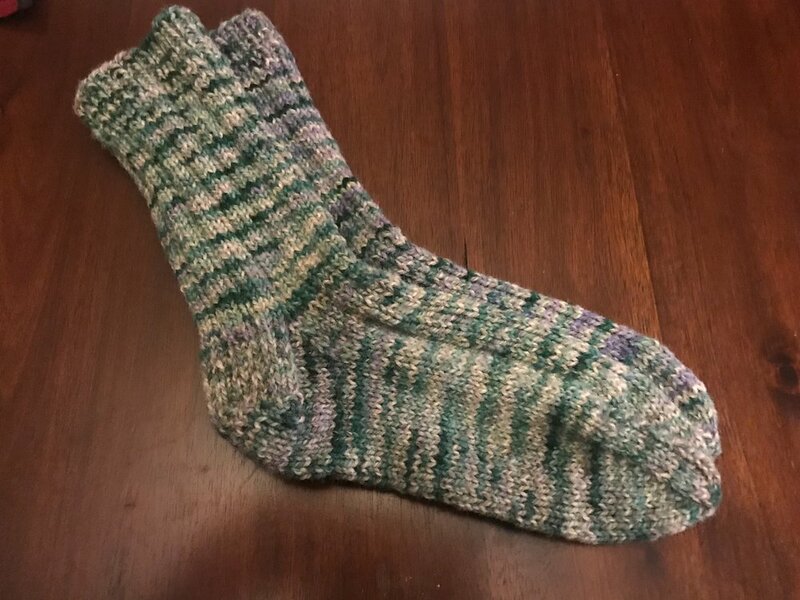 This class will utilize How I Make Worsted Weight Socks by Susan B. Anderson, pattern available for free on Ravelry. Susan’s worsted sock pattern is great for all level knitters and is easy to follow. This is a 2 part class. Please come to Week 1 (March 30) having already cast-on, with ribbing cuff and 3-4 in of leg knitted. Materials needed: US 5 double pointed needles, stitch markers. Please download the free pattern and bring a copy with you to class. Goals: Learn to knit beautiful and warm socks for yourself and those you love. This class will teach you the basics of sock knitting. Prerequisites: Must be able to cast-on, knit, purl, and bind-off. Experience with knitting in the round on double-points. Learn to knit beautiful and warm socks for yourself and those you love. This class will teach you the basics of sock knitting. Step into today’s fashion forward look. In this class you will learn a number of embroidery stitches that can be used to enliven your knitwear. Whether factory knit or hand knit, you can create exciting additions to sweaters, vests, hats, mitts & more. We will provide stitch how-to handouts so you can continue to create your own design ideas at home. You may choose to use this class to do a practice sampler, or dive right into adding embroidery to your piece, designing as you go. We’ll provide an idea sheet with a range of motifs, and where you might place them on your garment. 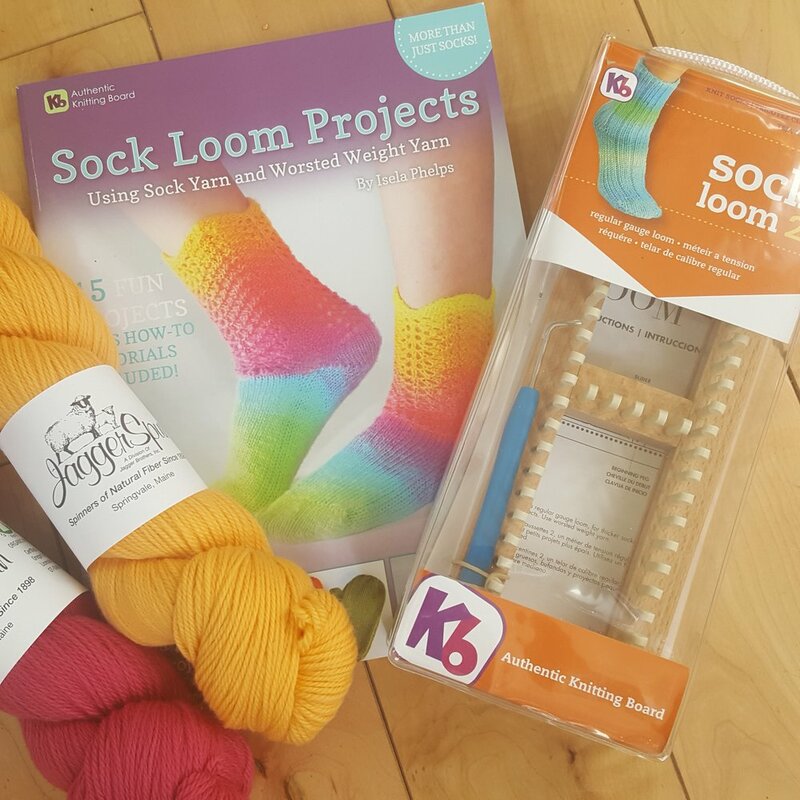 Materials: You will need to bring a piece of knit fabric or a finished garment to work on, odds & ends of yarn in a weight similar to the background fabric, a darning needle with an eye large enough to accommodate your stitching yarn. An embroidery hoop can be helpful, but is not necessary, as you can hold the fabric flat on your lap. If you want to start on a finished knit item, but are not sure you want to start with one of your precious handknits, you might consider buying a sweater at Goodwill, as they have a selection of basic knits you can practice on. This class will utilize Laura Treadway’s Citrus Hat pattern available for free on Ravelry. Materials needed: US 5-6 16 inch circular needle, stitch markers. Please download the free pattern and bring a copy with you to class. Materials included: 1 skein of JaggerSpun Mousam Falls. PREP WORK: Please come to class with your brim ribbing done. Prerequisites: Must be able to cast-on, knit, purl, and bind-off. Experience with knitting in the round on circular needles. This class will teach stranded colorwork and chart reading while knitting your own hat! Learn to carry 2 colors at a time, find the proper tension, understand ‘floats’, finishing and achieving a smooth, well mannered fabric, while knitting a cozy and beautiful hat. Goals/objectives: Cast on and work through most of the colorwork section. Learn to read the color chart. Understand how to work crown decreases. Materials included in class: Mountain Mist Hat pattern by Tincanknits and all needed yarn. This class is now full. To be added to the wait list please send us an email or call the shop. We have also added a second Beginner class on Sunday 1/27/19, from 1-3. We currently have 1 space remaining in this class, and 1 space open in our Saturday session. If you would like to register for this class please call the shop, 207/992-4140, or 207/299-6716, thank you. You may also click HERE to see info on our Beginner Continental class. If you have been waiting for a chance to learn to knit, this is it. Join us for our first Beginner Knitting class of the fall/winter session. In this class you will learn the basics of casting on, the knit stitch and the purl stitch. You will also learn some basic knitting theory to help you decipher patterns suitable for new knitters. If you are a lapsed knitter in need of a refresher, this class will help you reboot your skills. All registered folks are entitled to a 10% discount on all in store purchases made on the day of their class. We welcome you to our free workshop and talk. We will go over topics like yarn weight, importance of gauge/swatching, and yarn content as well as answering your knitty-gritty questions. This event is FREE and we will be LIVESTREAMING the event on Instagram (@onelupinewool) for our out of town friends. PLEASE RSVP IF YOU WILL BE IN ATTENDANCE. Bring your knitting bag, a friend and your questions for our fiberistas. Top Down Sock Class. Learn to knit beautiful and warm socks for yourself and those you love. This class will teach you the basics of sock knitting. We will being by making a baby sock first. This allows you to learn each piece of sock construction in a one day class. Those of you who move through this quickly, may cast on your own sock too. In this class you will learn basic embroidery stitches and create an all wool ornament in the style of the Finnish himmeli. Himmelis are visually striking geometric structures traditionally made of rye straw. A mobile like structure would hang above the dining table in a Finnish home during the holidays to ensure a good crop for the coming year. We will use this geometric marvel to practice basic embroidery on felted wool. This class will be a great way to brush up your hand stitching and create a fun ornament to give as a gift or keep for yourself this holiday season. You're a doll! Come make a woven version of yourself, with wool hair and twiddled arms. You will be beautiful. We will weave the body, and create the head and arms; I'll show you how to stuff, finish, and personalize him or her. Feel free to bring scraps of meaningful cloth, buttons, beads, or other doodads to incorporate. Come weave a small wearable “amulet“ using a simple loom, ancient techniques, and your hands. We will start a small pocket mades from beautiful materials, into which you can tuck something tiny and special— aspirin or secret messages! I will show you how to finish and embellish it. No weaving knowledge or experience is necessary! Feel free to bring scraps of meaningful cloth, buttons, beads, or other doodads to incorporate in your amulet. If you have been waiting for a chance to learn to knit, this is it. Join us for our first Beginner Knitting class of the spring/summer session. In this class you will learn the basics of casting on, the knit stitch and the purl stitch. You will also learn some basic knitting theory to help you decipher patterns suitable for new knitters. If you are a lapsed knitter in need of a refresher, this class will help you reboot your skills. Don't dread that summer road trip, pack your knitting bag!! "My name is Amanda Dunphy and I have lived in Maine all my life. I picked up loom knitting about 9 years ago when a friend saw how much I was struggling with needle knitting and bought me my first looms for a present. I learned by watching YouTube videos at the time, and struggling, because there was no one I knew of who could teach me. Looking back on those days I wish there was someone who would have been able to watch and guide me through the process. I hope to be that guide for you. Since those early days I have made hats, scarves, wrist warmers, bags, bottle cozies, head scarves, slipper socks, cowls, dish cloths, soap bags, pouches, stone/dice bags, some clothing, holiday stockings and ornaments, etc. In the class I will be teaching a basic cast on, knit and purl stitches, and a simple bind off method. We will also touch on reading patterns, as well as tips and tricks I have learned over the years. We will be making a thin scarf (approximately 5 inches wide, but that can be adjusted) done in the basket weave stitch. I will provide you with the pattern and explain how you can make this wider for you as well. During the class we will be simply making a swatch so you can practice and learn all the steps required." This class is one step up from Beginner Crochet. You will practice chain stitch, slip stitch, joining in the round, single crochet, & double crochet to make a hat from the top down. There will be ample time for 1:1 and progress on your hat. The pattern will also include further instructions for a crocheted flower embellishment which also used half-double & treble crochet stitches & scrap yarn in colors of your choice. If there is sufficient interest, I will teach a second class for crochet flower accents. You will need one skein of Worsted weight yarn and a size I (5.5mm) hook. We are beyond thrilled to be able to offer you a workshop with the very gifted Jenn Steingass. In the past few years Jenn has rocketed to the top of the hip knitting scene with her incredibly beautiful and timeless yoked sweater patterns. Her gift for movement, proportion, design, and color all come together in contemporary sweater patterns the that evoke a timeless, classic beauty. She will be teaching you her stranded yoke techniques so that you too can create these wonderful heirloom garments. "In this workshop, we'll practice knitting a top down stranded colorwork sweater while knitting a a small swatch in the round. Using my favorite invisible increase, you'll get a feel for how the yoke is shaped as you knit your swatch while following a top down chart. We'll go over color dominance, color theory, yoke sweater construction styles, and knitting with 2 colors of yarn per row. " Materials: Two 50g skeins of yarn in contrasting colors, included. “Tidal Cove Scarf” by Knitwise Design is a unique piece that is a lot of fun to knit! When you wear this scarf be prepared for other knitters to examine it and exclaim, “How did you do that?” In this class the designer will show you exactly how! Necklace Party Class. Express your style with beautiful yarn and beads in this class. Learn four new skills in one class. In this class you will travel through four stations, spending about 25 minutes with each instructor as you learn: Cables, Short Rows, 4 cast on techniques, and basic colorwork. Come to class prepared with a pre-knitted swatch in the round (on 16" circular needles), with about 3" already knit.